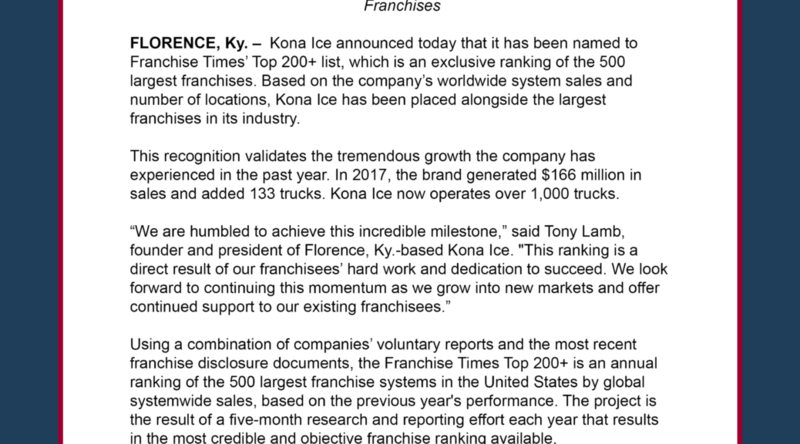 FLORENCE, Ky. – Kona Ice announced today that it has been named to Franchise Times’ Top 200+ list, which is an exclusive ranking of the 500 largest franchises. Based on the company’s worldwide system sales and number of locations, Kona Ice has been placed alongside the largest franchises in its industry. This recognition validates the tremendous growth the company has experienced in the past year. In 2017, the brand generated $166 million in sales and added 133 trucks. Kona Ice now operates over 1,000 trucks. Using a combination of companies’ voluntary reports and the most recent franchise disclosure documents, the Franchise Times Top 200+ is an annual ranking of the 500 largest franchise systems in the United States by global systemwide sales, based on the previous year’s performance. The project is the result of a five-month research and reporting effort each year that results in the most credible and objective franchise ranking available. To qualify for the ranking, companies must be a legal United States franchise, with its headquarters based in the United States or at least 10 percent of their total units located in the country. Franchisees must also own at least 15 percent of the company’s total units. The 200 franchises with the top global systemwide sales, including total sales for both franchise and company units, receive the highest rankings. Bringing tropical tunes and cups of shaved ice everywhere it stops, Kona Ice offers its distinctive blend of entertainment and gourmet frozen treats across 47 states. Equally as appealing as the icy treats that the brand offers is its philanthropic commitment in the communities it serves. Nationwide, Kona Ice has donated more than $50 million to community-based organizations since the launch in June 2007. Entrepreneurially spirited individuals interested in owning a Kona Ice franchise should have the ability to invest $117,125 – $135,925. An initial franchisee fee of $20,000 is required, and finance programs are in place to support qualified entrepreneurs in their Kona Ice investment. To learn more about Kona Ice, visit: https://www.kona-ice.com. For more information about available franchise opportunities with Kona Ice, please visit: http://www.ownakona.com. A true community ally renowned for facilitating endless fundraising options, Kona Ice has given more than $50 million back to neighborhood schools, organizations and teams since its inception in 2007. The brand’s iconic truck offers customers a one-of-a-kind experience, featuring the opportunity to create their own shaved ice on the self-serve Flavorwave™, while enjoying the soothing sights and sounds from the tropics. Currently, there are nearly 1,000 franchise units in more than 47 states. The Franchise Times Top 200+® is the only ranking by systemwide sales and units of the largest 500 U.S.-based franchise brands. Published in the October issue and available in a searchable database online, the Franchise Times Top 200+ also analyzes industry sectors based on percentage change in sales growth, reports the 10 fastest- growing franchises by four different measures, and includes exclusive news stories about the biggest names in franchising. The rankings and full report, and the searchable online database, are available at www.franchisetimes.com.